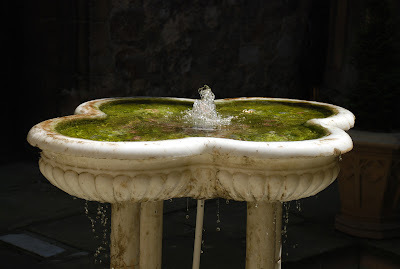 A few days ago I went to Leeds Castle again and the beautiful and very small inner courtyard was open to the public. I have always wanted to go in there and this time, not only I was allowed in but we were also blessed with beautiful sunshine which made the whole place look magical. I took several photos of the windows and a couple of the fountain. I thought I would share it with you. I love fountains! In this photo I can almost hear the water trickling . . . I also love fountains and this one is simply beautiful. Thank you for "serenity." Wonderful photo! Makes me want to hang out here for hours listening the sound of the fountain. Very zen.